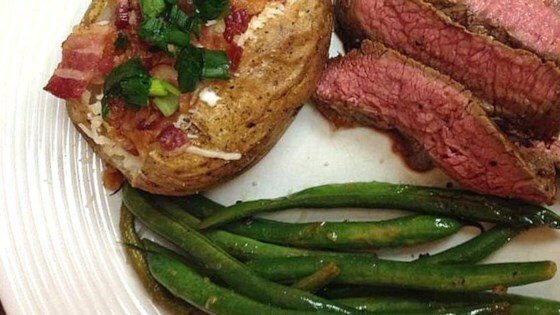 "A wonderful flank steak on the grill recipe I invented that friends just love! My girls think this is great, and it doesn't take long to grill. This also works great when sliced and used for fajitas." Marinated for 6 hours. I did this recipe exactly. Steak had a strong taste to it but couldn't finger the problem. I will stick to my own recipe next time. I cooked this in my broiler for 8 mins. on each side, basting occasionally with marinade. It was medium rare and quite good. Nice way to tenderize a tougher piece of meat.